Newton C. Estes of A Platoon, 567 Company, jumping over the bar in the high jump competition, 1945. Photograph by Carl Zeigler. RG2/002, American Field Service World War II Photographic Collection. This image cannot be reproduced outside the guidelines of United States Fair Use (17 U.S.C., Section 107) without advance permission from the AFS Archives. Toward the end of World War II, American Field Service ambulance drivers in 567 Company were stationed at an embarkation camp in Pisa, Italy, awaiting movement orders. The ambulance drivers coordinated a two-day track and field meet that included a high jump, running and wheelbarrow races, and a tug-of-war competition between the different platoons of 567 Company during this period of inactivity. Directly following the meet, 567 Company received orders to embark for France aboard an LST, a ship meant for transporting vehicles and personnel. 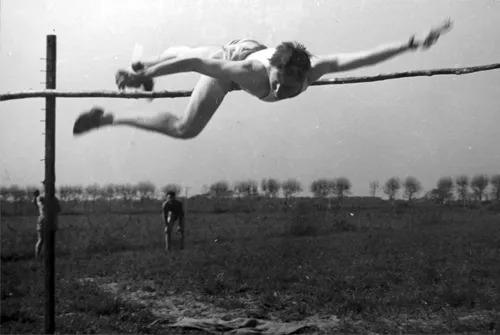 This photograph shows Newton C. Estes of A Platoon jumping over the bar in the high jump competition. More photographs of the two-day track and field meet can found in Carl Zeigler’s photographic album in the American Field Service World War II Photographic Collection. This album can be viewed during a scheduled research appointment in the AFS Archives.